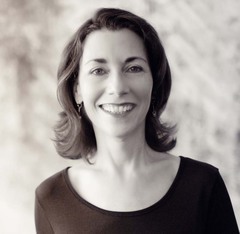 Mare Swallow is the Founder and Executive Director of the Chicago Writers Conference, as well as a professional public speaker and public speaking coach. She's the author of "25 Ways to Engage Your Audience," and is currently writing a book that aims to help liberal arts majors get jobs after college. Please join Mare and all our outstanding readers on Tuesday, June 4th, 2013, upstairs at Hopleaf at 7:30 pm. This 21-and-older event is free. In 2001, Lawrence Santoro's novella "God Screamed and Screamed, Then I Ate Him" was nominated for a Bram Stoker Award by the Horror Writers Association. In 2002, his adaptation and audio production of Gene Wolfe's "The Tree Is My Hat," was also Stoker nominated. In 2003, his Stoker-recommended "Catching" received Honorable Mention in Ellen Datlow's seventeenth annual Year's Best Fantasy & Horror anthology. In 2004, "So Many Tiny Mouths" was cited in the anthology's eighteenth edition. In the the twentieth, his novella "At Angels Sixteen," from the anthology A Dark and Deadly Valley, was similarly honored. Larry's first novel, Just North of Nowhere, was published in 2007. A collection of his short fiction, Drink for the Thirst to Come, was published in December 2011. Before all that, Larry spent thirty years as a director, producer and actor in theater and television. 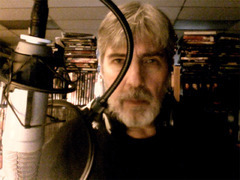 Since its inaugural show in January, 2012, Larry has been the host of the weekly horror podcast, Tales to Terrify, the sister show to the Hugo Award-winning StarShipSofa. He lives in Chicago and is at work on two new novels, Griffon and the Sky Warriors and A Mississippi Traveler, or Sam Clemens Tries the Water. Stop by his blog, At Home in Bluffton. Please join Larry and all our outstanding readers on Tuesday, June 4th, 2013, upstairs at Hopleaf at 7:30 pm. This 21-and-older event is free. brought destruction, but green too. Just in time for May. If you enjoyed that, we'll have more video from the evening coming up in the next few weeks. 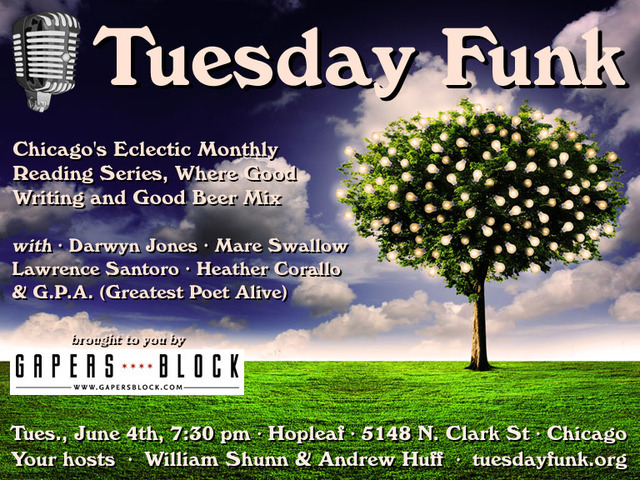 And please join us at 7:30 pm on Tuesday, June 4th, 2013, upstairs at Hopleaf, for an evening with Darwyn Jones, Heather Corallo, Lawrence Santoro, Mare Swallow, and G.P.A. (Greatest Poet Alive). Don't miss it! We've put together a brilliant lineup for our next Tuesday Funk! The roster will feature Darwyn Jones, Heather Corallo, Lawrence Santoro, Mare Swallow, and G.P.A. (Greatest Poet Alive). Throw in a handful of our patented Haiku by Andrew, not to mention your pick of cold beers from around the world, and you've got all the ingredients for an evening that will glow in your memory for weeks to follow. The evening gets underway with your host Andrew Huff on Tuesday, June 4th, 2012, 7:30 pm, in the upstairs lounge at Hopleaf, 5148 N. Clark St., Chicago. (Bill will be on vacation.) Arrive early for a table and grab a beer from Mark at the bar (where credit cards are now accepted!). We start seating at 7:00 pm and no earlier. Admission is always free, but you must be 21 or older. And come early or stay late after for some great Belgian-style food downstairs. It was another packed room for this past Tuesday night's edition of Tuesday Funk at Hopleaf, and the standing-room crowd seemed to think it was a great show all around. If you couldn't be there, let's recap what you missed. We kicked off the fun with Suzanne Clores, who brought us the true tale of a limo ride through lower Manhattan with a Brooklyn mobster. Our former co-host Sara Ross Witt followed that up with an excerpt from a story of a dysfunctional family of possible psychics. Co-host Andrew Huff continued his new monthly feature with a handful of Haiku by Andrew ripped from recent headlines. And Robert McDonald treated us to a selection of his poetry, including the greatest poem about the might rhinoceros that you'll ever hear. After a break for beer, our Poem by Bill, "What Changed?," was entirely unlike his short story of the same name from last month. Next, returning reader Dion Walton told the heartfelt story of his battle with HIV and his attempts to escape the morgue door. And finally, Mary Beth Hoerner closed out our program with a delightful and powerful short story about pride and childhood secrets. All in all, it was an amazing night, but if you couldn't be there, don't despair. We'll bring you plenty of video excerpts in the weeks to come, and then we'll try to top ourselves yet again on Tuesday, June 4, 2013, with a program featuring Darwyn Jones, Heather Corallo, Lawrence Santoro, Mare Swallow, and G.P.A. (Greatest Poet Alive). Don't miss it! Now let's take a ten-minute break, people. Smoke 'em if you got 'em. Reminder: Tuesday Funk #57 is tonight! Don't forgettonight is Tuesday Funk's 57th episode, featuring Suzanne Clores, Mary Beth Hoerner, Robert McDonald, Dion Walton, and Sara Ross Witt. Don't miss it! Our readings take place at Hopleaf Bar, 5148 N. Clark St. in Chicago. We get started promptly at 7:30 pm in the upstairs lounge. Arrive early if you want a seatbut no earlier than 7:00 pm. Our readings are free, but only those 21 and over will be admitted. No food can be brought in from the restaurant. See you there! 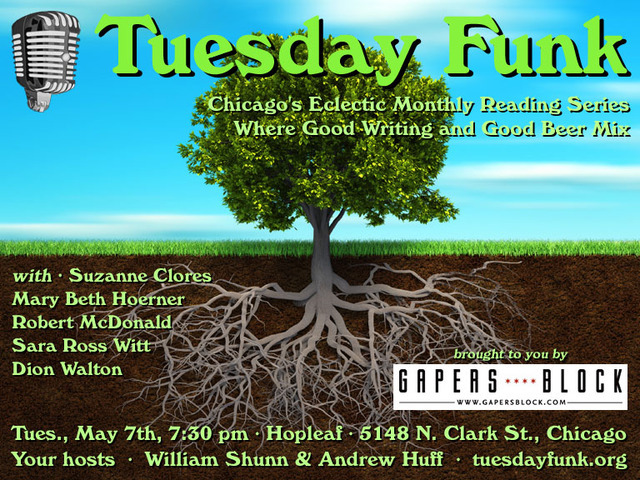 And if you enjoyed that, please join us at 7:30 pm tomorrow night, Tuesday, May 7th, 2013, upstairs at Hopleaf, for an evening with Suzanne Clores, Mary Beth Hoerner, Robert McDonald, Dion Walton, and former co-host Sara Ross Witt. Don't miss it! 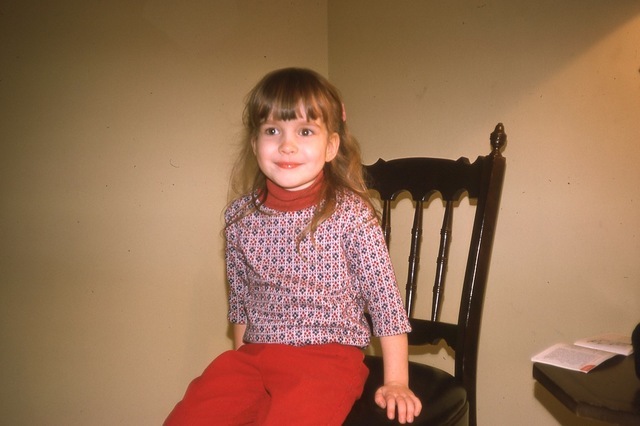 Mary Beth Hoerner is a Chicago playwright and fiction writer. Her play Atomic Honeymoon was performed at the CORNservatory, she is a network playwright at Chicago Dramatists, and she was the recipient of a Ragdale residency in playwriting. Her short fiction has appeared in Hair Trigger and Hypertext, and her memoir "Night Games" appears in the anthology Cubbie Blues: 100 Years of Waiting Till Next Year. She co-hosts The Chicago Way literary reading series and is a board member of 2nd Story. Her education includes an M.A. in English from the University of Illinois and an M.F.A. in fiction writing from Columbia College Chicago. Please join Mary Beth and all our outstanding readers on Tuesday, May 7th, upstairs at Hopleaf at 7:30 pm. This 21-and-older-only event is free. 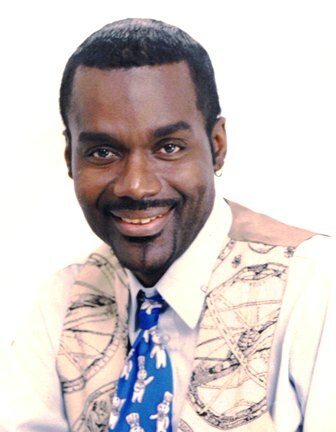 Originally a theater performer for 25 years, Dion Walton has been writing for the past ten. He's a published writer (Our Legacies: Writings from Chicago's Older Gay Men), a singer, and an artist who has presented work in galleries in the Chicago area. At present he is writing his autobiography, The Happening, and also writing and performing with The Goodman Theater. Follow him on Facebook at his page "Where is Dion Now?" Please join Dion and all our outstanding readers on Tuesday, May 7th, upstairs at Hopleaf at 7:30 pm. This 21-and-older-only event is free.